The Old Oak Festival features a variety of artisan and craft vendors, offering a sample of the rich traditions of the East Tennessee area. Artisan and craft vendors are located both outdoors on campus and in the Pioneer Arena located inside the Niswonger Commons building. Vendors have offered a variety of wares from wood carvings, paintings, jewelry, photography, wooden toys, knitted or crocheted items, furniture and homemade candy, preserves and bread. The Old Oak Festival will feature more than 100 arts and crafts vendors, food vendors and authors as part of Authors’ Row. Steve Harrison, a 1977 alumnus of Tusculum, will have his creations from reclaimed steel on display at the Old Oak Festival. While most vendors are local, Old Oak does feature some from far afield, such as Steve Harrison of New Jersey. 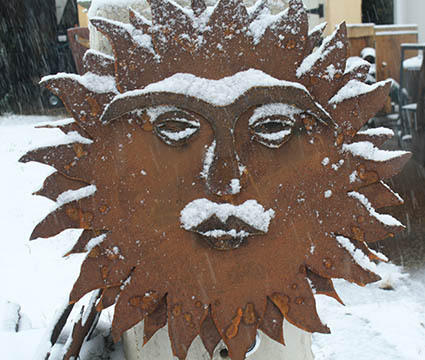 This 1977 graduate of Tusculum will be returning to campus with some of his decorative creations fashioned from reclaimed steel. Other vendors will be individuals that are familiar to the local community, such as local artist Robert Whittenburg. During the Festival, Whittenburg will have on display his original paintings, prints and note cards, including those of the iconic Tusculum Arch. Whittenburg, who lives in Mohawk, has been painting since he retired from the Hamblen County School System, starting with small renditions and gradually moving to larger canvasses. 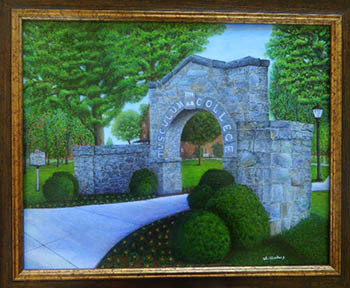 Some booths will have a flavor of campus, such as a display by local artist Robert Whittenburg that will include this print of the iconic Tusculum Arch.